The 1984 United States presidential election in Oklahoma took place on November 6, 1984. All 50 states and the District of Columbia, were part of the 1984 United States presidential election. Oklahoma voters chose eight electors to the Electoral College, which selected the president and vice president of the United States. Oklahoma was won by incumbent United States President Ronald Reagan of California, who was running against former Vice President Walter Mondale of Minnesota. Reagan ran for a second time with former C.I.A. Director George H. W. Bush of Texas, and Mondale ran with Representative Geraldine Ferraro of New York, the first major female candidate for the vice presidency. Reagan won all but three counties, and lost the three he did lose by a combined aggregate of only 381 votes. The presidential election of 1984 was lopsidedly a two-party affair for Oklahoma, with over 99 percent of the electorate voting for either the Democratic or Republican parties, and only three parties qualifying for the ballot. Nearly every county in Oklahoma voted in majority for the Republican candidate, a particularly strong turn out even in this typically archconservative state. This trend included Oklahoma City's Oklahoma County. Reagan did best in Texas County, and Mondale did best in Hughes County. The former Democratic stronghold in the Southeastern part of the state is evident in this election as only marginally Republican. Oklahoma weighed in for this election as 10% more Republican than the national average. Walter Mondale accepted the Democratic nomination for presidency after pulling narrowly ahead of Senator Gary Hart of Colorado and Rev. Jesse Jackson of Illinois – his main contenders during what would be a very contentious Democratic primary. 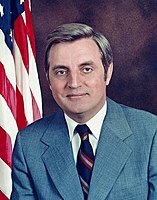 During the primary campaign, Mondale was vocal about reduction of government spending, and, in particular, was vocal against heightened military spending on the nuclear arms race against the Soviet Union, which was reaching its peak on both sides in the early 1980s. Reagan won the election in Oklahoma with a resounding 38 point sweep-out landslide. While Oklahoma typically voted conservative at the time, the election results in Oklahoma are also reflective of a nationwide reconsolidation of base for the Republican Party which took place through the 1980s; called by Reagan the "second American Revolution." This was most evident during the 1984 presidential election. Reagan also enjoyed high levels of bipartisan support during the 1984 presidential election, both in Oklahoma, and across the nation at large. Many registered Democrats who voted for Reagan (Reagan Democrats) stated that they had chosen to do so because they associated him with the economic recovery, because of his strong stance on national security issues with Russia, and because they considered the Democrats as "supporting American poor and minorities at the expense of the middle class." These public opinion factors contributed to Reagan's 1984 landslide victory, in Oklahoma and elsewhere. ^ "1984 Presidential General Election Results – Oklahoma". Dave Leip's Atlas of U.S. Presidential Elections. Retrieved 2013-11-11.